This isn’t the first time San Loco has had to move its Williamsburg location. Back in 2014, it lost its lease on North 4th Street and decamped to its current home at 637 Driggs Avenue. But Jill Hing, who owns the taqueria with her husband Kimo, tells us adjacent construction and the on-again, off-again L-train shutdown have put such a dent in their bottom line that they’ve been having trouble making the rent. She says that since October, sales have been down 25 percent compared to the same time period last year. 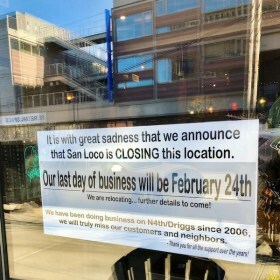 Hing declined to say how much San Loco owes its landlord. But she told us she and her husband, who started the business in 1986 with two brothers who are no longer involved, have been let out of their lease and are now negotiating for a space that’s “more towards Bushwick,” on the other side of the BQE. As for San Loco’s one remaining location, on the Lower East Side, Hing assures us “it’s fine, it’s doing well,” and she says she’s even hoping to return to the East Village now that rents have gone down a bit. For now, though, she’s focused on the Brooklyn relocation. As of this posting, the GoFundMe campaign has raised over $4,700. We need more local places like San Loco and more small business owners like Jill and Kimo to keep the spirit of NYC alive and keep it from turning into the same as every place else. I wish them every success with their fundraiser!